Hello and welcome to the coverage of day 2 of the third Test between England and India at The Rose Bowl. The match starts at 3.30 PM. Follow this link for Live scores and updates. 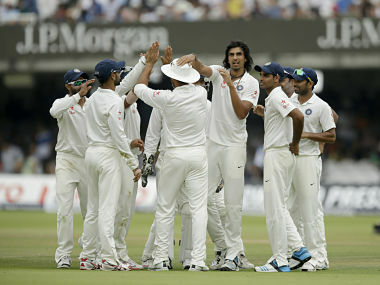 England cruised to 247/2 on day 1 and here's Jigar Mehta explaining why India missed Ishant Sharma. FirstpostIndia's bowling coach Joe Dawes was apprehensive about Ishant Sharma's fitness, saying the pace spearhead will undergo tests in the next few days. Lunch day 2: Another splendid session for England. They scored 111 runs for the loss of just one wicket. Lunch, day 2: ENG-358/3. Right! Back for the post-lunch session. Mohammad Shami will start off proceedings for India. FOUR! Superbly placed. Bell stays in his crease and just steers it through slip cordon for a boundary. Bell has scored a lot of runs through the third man region. Time for Dhoni to place a third man! Pankaj Singh into the attack now. The Indian bowlers aren't getting any movement. Nothing special from any bowler so far. Yes, they are missing Ishant and his magical spells. Bhuvneshwar Kumar will continue. Dhoni has come up to the stumps now. A tad full outside off, Bell leans forward and drives it through point for a couple. There is a deep point in place. Shami bowls a good bouncer to end the over. Eng - 372/3! FOUR! On the pads from Pankaj and Bell isn's going to miss out on it in this form. Flicks it to long leg for a boundary.